As per reports, an official announcement is expected later today. A Rajya Sabha member from the NCP said that Pawar's candidature for the Lok Sabha isn't finalised but a senior state leader confirmed the decision. 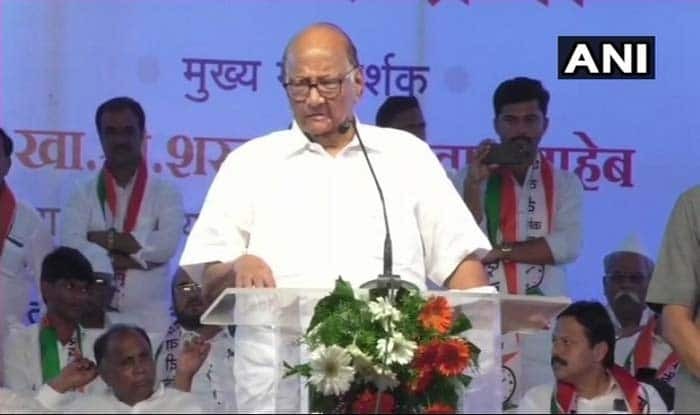 Mumbai: Nationalist Congress Party (NCP) president Sharad Pawar is likely to contest Lok Sabha Elections 2019 from Maharashtra’s Madha constituency, said party sources in Mumbai on Wednesday. As per reports, an official announcement is expected later today. A Rajya Sabha member from the NCP said that Pawar’s candidature for the Lok Sabha isn’t finalised but a senior state leader confirmed the decision. It must be noted that last year, NCP leader Jitendra Ahwad had said that Pawar will not contest the Lok Sabha polls again. “Pawar has told the party not to consider his name as he will not be a candidate. In today’s meeting, Pawar said he is not in the (LS) race and nobody should propose his name,” said Ahwad. The NCP had demanded a 50-50 seat-sharing formula for the state’s 48 Lok Sabha seats in its alliance talks with the Congress. The two parties had entered into an alliance in 2014 and the Congress contested 27 seats while the NCP put up candidates on 21 LS seats. On November 2018, the NCP and the Congress in Maharashtra reached out to the Left and smaller parties in their bid to form a united front against the BJP in the upcoming Lok Sabha Elections. Sharad Pawar has been the chief minister of Maharashtra three times besides being the Defence and Agriculture Minister in the centre.